You can download a printable pdf with 8 different species of Horned Lizards found in the U.S. HERE. The Pygmy Short-horned Lizard is found in the Pacific Northwest from northern California through Oregon and Washington to British Columbia, Canada, and east through southeastern Idaho. The species occurs in forest habitats and open plains with sagebrush at elevations from about 400 to 8,000 feet. Phrynosoma douglasii can be distinguished from other horned lizards by its small adult size of only 2-3 inches, one rowof abdominal fringe scales, and head spines that are very short and reduced with a deep notch between them. 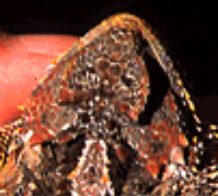 Their back scales are irregular in size and distribution and set in a rosette of smaller, keeled scaleswhile scales on their ventral (belly) side are smooth. found between 2,000 and 10,400 feet in elevation. Phrynosoma hernandesi can be distinguished from other horned lizard species by the following: one rowof abdominal fringe scales, reduced central horns separated by a deep notch and slightly longer side horns, back scales are arranged in 6-8 rows. 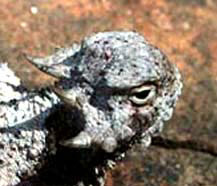 This species is the Wyoming State Reptile. Desert Horned Lizards have a widespread range from Oregon and Idaho, south through Utah, Nevada, western Arizona, southern California and into northeastern Baja and northwestern Sonora, Mexico. They occur at elevations from below sea level to about 6,600 feet throughout the Great Basin, Mojave, and SonoranDeserts. The species can be found nearwoody shrubs, cacti, rocks and yuccas in alluvial fans, flats, washes, and valleys. 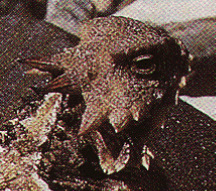 Phrynosoma platyrhinos has two long central horns and shorter side horns. 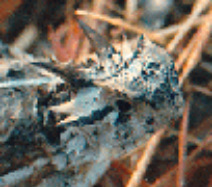 Desert horned lizards have a single row of abdominal fringe scales and a smooth back with a few scattered,larger spines. to sand dunes, typically at elevations frombelowsea level to 1,000 feet. 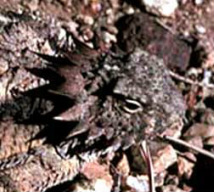 Flat-tailed Horned Lizards have a long tail,which is broad and flat. Phrynosoma mcallii has two central horns, which are very long and sharp, and long side horns. The species has two rows of small abdominal fringe scales; the second row is often reduced. 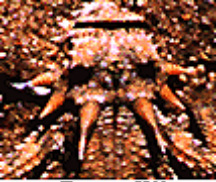 The species also has a dark line down the middle of the back. means “of the sun”). 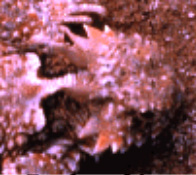 They have a single row of large abdominal fringe scales and a spiny back. Background body colors are often combinations of browns, grays, and black. Round-tailed Horned Lizards occur in Chihuahuan desert and grassland communities from extreme southeastern Colorado and western Oklahoma through west Texas and New Mexico to southeastern Arizona. The range extends south into the Mexican states of Chihuahua, Coahuila, Zacatecas and San Luis Potosí. They are found on rocky substrates in desert flats, canyons, semiarid plains, and scrublands at elevations from about 600 to 7300 feet. The four short horns on the back of the head are equal in length and additional side horns are short. Their backs are not spiny. The species has round, cylindrical tails that are usually banded. Background coloration varies to match local soil, but the species does have dark blotches on the sides of the neck and shoulder area. 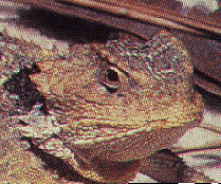 Phrynosoma modestum is the only species that lacks abdominal fringe scales. fringe scales. The intensity of their colors differs between individuals and populations, but they usually have a white or pale stripe down the middle of their backs and dark stripes radiating from the eye to upper lip and on the top of the head. This species is the Texas State Reptile. Photos above used by permission of Wade Sherbrooke from his book, "Introduction to Horned Lizards of North America". Get a TEXAS Conservation License Plate for your vehicle!